High-intensity interval training (HIIT) is an exercise format that alternates periods of short, intense exercises with less-intense recovery periods. HIIT is offered as a Group Exercise class at the Y, which means it’s free for members. 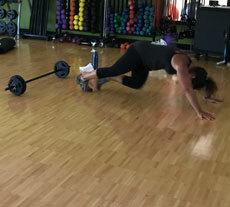 Nikki Sykora, group fitness instructor and Personal Trainer at the Hastings Y touts HIIT as, “The best workout.” Here’s why: the short, intense, total-body workouts improve athletic capacity and condition, glucose metabolism, fat burning—and it’s fun. “If you come to HIIT regularly, you’ll boost your metabolism faster than you would see just running on the treadmill,” Nikki says. At the Hastings Y, HIIT classes are 30 minutes, which means you can get an efficient strength and cardio workout done with just a short amount of time. In Nikki’s classes, she starts with a warm up to get the blood flowing. The rest of the half hour includes sets of 60 seconds of strength work, followed by 30 seconds of cardio work, done in sets—plus loads of energy and encouragement. If you like R.I.P.P.E.D., HIIT uses a similar combination of cardio and strength exercises. Newbies are always welcome to join HIIT classes. HIIT classes by name can be high intensity, however, all fitness levels are welcome—exercises can be modified to match your abilities. Remember that your first HIIT class is your starting point, and that you’re there to focus on your goals (not what everyone else is doing). During class, pay attention to what your body is feeling—if you need to take a break, just do what you can and re-join the activities when you’re ready. Find a HIIT class at your local Y to give this efficient workout a try.